From early in his career Telemann was very interested in the various styles across Europe. He not only became acquainted with the two dominant ones, the French and the Italian, but also the traditional music of Poland and Moravia. In his music he welded the various influences together. However, he felt more attracted to the French idiom than anything else. That comes especially to the fore in the large number of orchestral overtures, modelled after the instrumental suites from the operas of Lully. Even in his contributions to such a typically Italian form as the solo concerto he included elements of the French style. The so-called 'Paris Quartets' belong to his best-known chamber works, and these again attest to his appreciation of the French idiom. There is some confusion about the name 'Paris Quartets'. It often refers to the two sets of compositions for three melody instruments and bc which Telemann published in 1730 and 1738 respectively. However, strictly speaking only the second set deserves this title as these were printed in Paris and probably composed during Telemann's stay in the French capital in 1737/38. The first set was printed in Hamburg and dedicated to a German flautist, Joachim Erasmus von Moldenit. In 1737 this set was reprinted in Paris, obviously reflecting the great popularity of Telemann's music in France which was also the reason that he was invited to visit Paris. This disc includes pieces from both sets. The name 'Paris Quartets' should not suggest that they are written in a purely French style. In fact they reflect a mixture of French and Italian elements - and the odd influence of traditional music, although not in the pieces recorded here - which was known as the goût réüni. The six quartets of the first set - divided into two sonatas, two suites and two concertos - include many elements of the Italian style. On the present disc that is especially demonstrated in the Concerto I in G which comprises three movements. The first movement is divided into four contrasting sections, and the second consists of three sections. The latter is a kind of recitative in a style which is purely Italian. The fact that this set was so popular in France that it was reprinted in Paris attests to the growing acceptance of the Italian style in France. The days in which it met scepticism and even rejection were long gone. The second set of quartets - all of which were called quatuor - was received with the same enthusiasm. Whereas in the first set the movements have Italian titles in the second they are all in French. Here the French idiom dominates but they are certainly not devoid of Italian streaks. Both elements come off quite well in these performances. 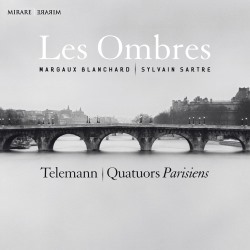 Les Ombres has to compete with quite a number of recordings some of which include both sets or one of them complete. The fact that we get here only four pieces seems the only minus to count against this disc. As far as the performances are concerned, Les Ombres seems a match for the rival recordings which I have heard. Those who don't need all of them should seriously consider it.